Desh Bhagat University, best private university in Punjab (2nd Rank, NIRF Ranking- MHRD, Govt. 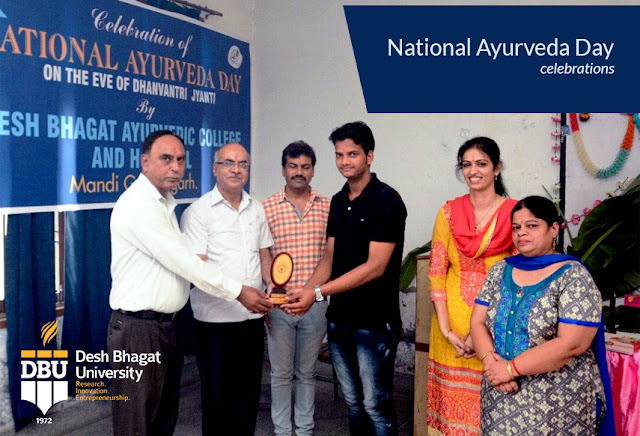 of India) Faculty of Ayurveda and Research at PG school of Ayurveda celebrated 2nd National Ayurveda Day with full fervour. A special function was organised, in which a large number of students and staff members participated. The celebration started with the Havan and Pujan of Lord Dhanwantri. Presiding over the programme at PG school of Ayurveda, Vice-Chancellor Dr. Virinder Singh said that Lord Dhanvantri is founding father of Ayurveda and an epitome of health in life. He told that Ayurveda is very old and unique health system initiated by our Saints and Sages and is very useful to keep ourselves healthy and fit without any side effects. 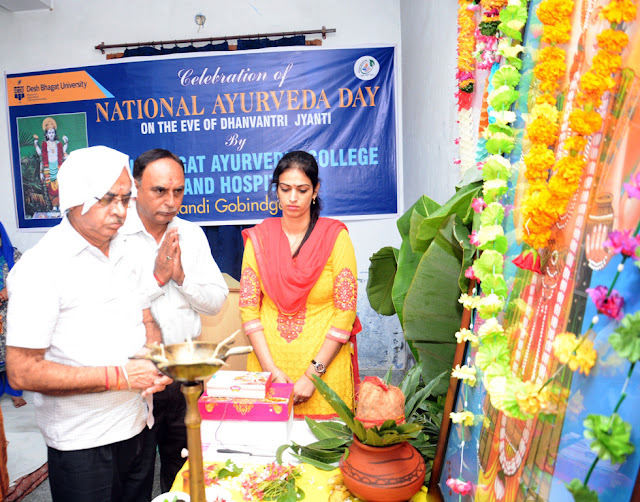 Chancellor Dr. Zora Singh and Pro Chancellor Dr. Tajinder Kaur exhorted the students to work hard and motivated them for practicing and to promote Ayurveda to the maximum. 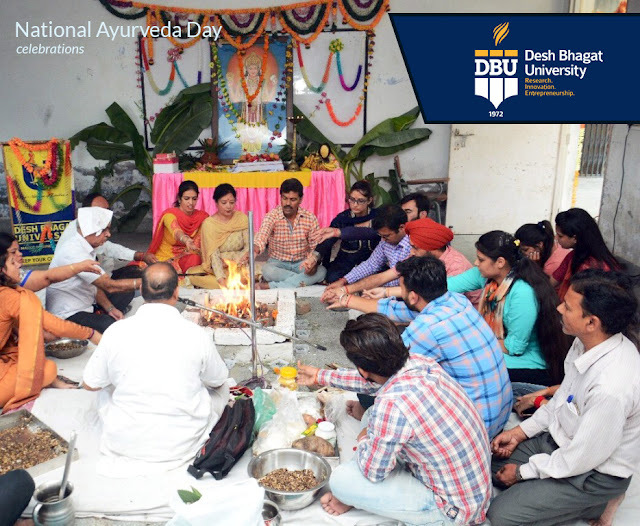 Director Dr. Kulbhushan expressed his views about the importance of the National Ayurveda Day and Dhanvantri Jayanti. The university offers some of the best Ayurveda courses in India. He added that Ayurveda is a science to protect health of all human beings and to cure the diseases. A cultural programme was arranged in which students showcased their skills. 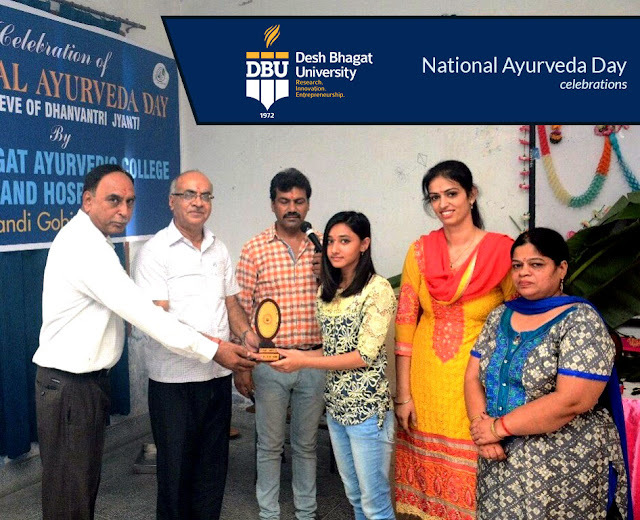 An essay writing competition on the Importance of Ayurveda in collaboration with the team of NASYA Punjab was also held, in which Darshika student of BAMS-I got first prize, Pawan Vishnoi BAMS-I got 2nd prize and Ravinder Kaur BAMS-4th year got 3rd prize. Later the students who got positions in different cultural items were also honoured.